The Marketing Preference & Consent Management Portal is a secure, cloud-based application that allows for enterprise wide collation and management of consumer consent and preference across multiple channels and brands, integrating easily with existing in-house and third party systems. Designed from the ground up to allow your customers and prospects direct access to their preferences. Put your customers in control over the communications they have with you. Secure through default and design. Both the GDPR & forthcoming ePrivacy Regulation insist that organisations be accountable for their compliance and in particular with consent. Consent not optimised. No easy way to centrally manage and measure consent wording to optimise opt-in rates. Consent not granular or specific. New rules mean more and specific consent with existing systems unsuitable. Lack of a single source of the truth. Use of multiple systems and legacy systems across the organisation with no single view or system of record. High cost of change. Changing all your current and incompatible systems to incorporate the required newf unctionality will take time and money. Our GDPR Marketing Preference & Consent Management Portal is packed with features to ensure legal compliance and engage effectively with your customers. 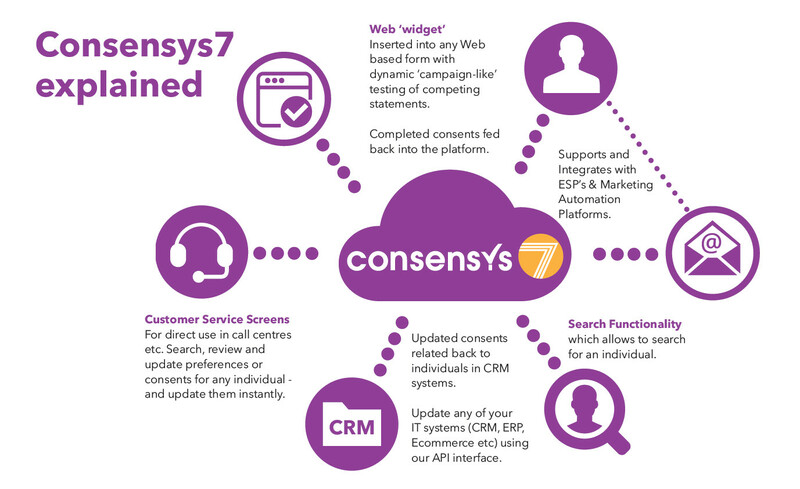 "Consensys7 not only ensures that we are GDPR compliant but arguably as important that we now communicate more effectively and efficiently with our customers"
(C) 2019 All rights reserved. Copyright. Rakata Technology Ltd. Registered in England: 06042392 - Consensys7 is a Rakata Technology product.